… census tracts are important for many reasons. It is easy to misidentify or misunderstand patterns and characteristics within cities, counties and metros which become obfuscated using these higher level, more aggregate, geographies. Many cities and counties that might be experiencing demographic-economic decline will often have bright spots that are groups of a few or many census tracts. The following graphic shows percent population age 25 years and over with bachelor’s degree by census tract based on ACS 2014 5 year estimates for a portion of the Los Angeles metro. Accommodating different demographic-economic thresholds/patterns, different legend color/data intervals are used. The pattern layer is set to 80% transparency enabling a view of earth features. Click graphic for larger view, more detail and legend color/data intervals. This map illustrates the geographic level of detail available using census tract demographics and the relative ease to gain insights using geospatial data analytics tools. Census tracts are important for many reasons. A partial list of reasons is provided below. • Covering the U.S. wall-to-wall, census tracts are the preferred “small area” geography for superior data analytics. • The Census Bureau now produces annual tract demographic-economic data from the American Community Survey; there is an evolving time-series at the tract level creating new analytical opportunities. • Originally developed to equivalence neighborhoods, many still do. • Defined by the Census Bureau in collaboration with local groups, tracts typically reflect boundaries meaningful for local area analysis. • Defined generally for use with each new decennial census, most tract boundaries are stable and non-changing for ten years and many much longer. • Designed to average 4,000 population, there are more than twice as many census tracts (73,056) than ZIP code areas (33,129). • Tract boundaries are well-defined; unlike ZIP code areas which are subject to multi-sourced geographic definitions. • Many data developers (e.g., epidemiologists) use census tract geography to tabulate their own small area data enabling more effective use of those data with Census Bureau census tract data. • As a statistical geographic area (in contrast to politically defined areas, census tracts are coterminous with counties; data at the census tract level can be aggregated to the county level. • Small area estimates for tracts are typically more reliable than for block groups. • Census tracts are used by many Federal, state and local governments for compliance and program management. The annually updated American Community Survey provides “richer” demographic-economic characteristics for national scope census tracts. While Census 2010 provides data similar to those items in the General Demographics section, only ACS sourced data provide details on topics such as income and poverty, labor force and employment, housing value and costs, educational participation and attainment, language spoken at home, among many related items. The approximate 600 items accessible via the tract dataset are supplemented by a wide range of additional subject matter. ACS census tract data are updated annually in December of each year. Join me in a Data Analytics Lab session to discuss more details about using census tract geography and demographic-economic data. Learn more about integrating these data with other geography, your data and use of data analytics that apply to your situation. Migration is one key element in determining how the demographics of an area are changing. County to county migration data provide insights into how the county population might change in the future. Seven of the top 10 flows of movers were among counties in the Los Angeles and Riverside-San Bernardino, CA metro areas. An estimated 44,020 people, an average of about 121 per day, moved from Los Angeles County to San Bernardino County, CA. Use this interactive table (click link) to examine patterns of in-bound and out-bound county-to-county movers. The table contains all combinations of from- and to- county movers and is quite large; it may take a minute to initially load. The following graphic illustrates use of the interactive table showing movers from Los Angeles County “1 year ago” to the “current county of residence.” The destination county with the largest number movers (44,020 – see pointer) was to San Bernardino County. Note that the movers — 44,020 — is the same number as shown in the table above. But using the interactive table, it is possible to view every destination county. Conversely, you can determine the number of inbound movers for every origin county. To develop the graphic shown above, follow the steps using the interactive table. – Click Find R1YA button below table. – Click R1YA Columns button below table. Table now looks similar to above view. – Finally, click the header cell in the Movers column to sort in descending order. Try this sequence for any county of interest — start with ShowAll button. Contact me to obtain a migration profile for a county of interest. A new post of county-to-county migration is planned for late 2013 or early 2014 using similarly structured data from ACS 2011 — a one year update to data reviewed here. A subsequent new post of county-to-county migration is planned for mid 2014 using similarly structured data from ACS 2012 — a two year update to data reviewed here. These three years of annual will be organized into a mini-time-series to examine annual county-to-county migration patterns over time. The geography of the urban landscape has been updated with new 2010 vintage urban areas (Urbanized Areas and Urban Clusters). Census 2010 data have been tabulated by census block, categorizing each census block as either urban or rural. Thus, all higher level Census 2010 geography (block groups, tracts, cities, and on up to the U.S. national level) can be characterized as percent urban and rural. See more about urban population and geography. 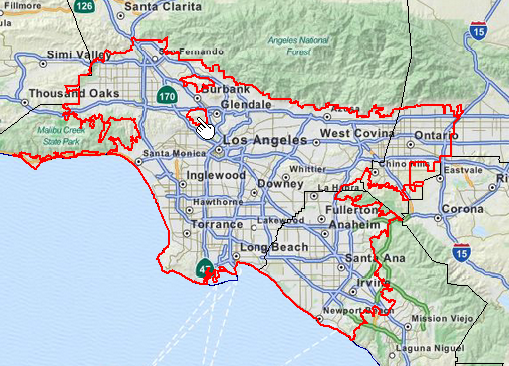 The graphic presented below shows the 2010 vintage Los Angeles–Long Beach–Anaheim, CA Urbanized Area (UA) with red boundary superimposed on MapQuest OpenStreetMap tile layer. Other contiguous urban areas exist but are not shown in this view. In this case, the UA encompasses all of the geography within the red boundary except two small areas (see pointer) north of Burbank and west of Glendale. This reflects the fact that UAs are defined on the basis of census blocks either being urban or rural. Viewing graphic with gesture/zoom enabled device suggested. More than 80-percent of America’s population is urban, but far more than 80-percent of America’s geography is rural. Census 2010 shows that America’s urban population increased by 12.1 percent from 2000 to 2010, compared to the national overall growth rate of 9.7 percent. Urban areas now account for 80.7 percent of the U.S. population, compared to 79.0 percent in 2000. Use this interactive table to examine Census 2010 Urbanized Areas and how they have changed since Census 2000. Census 2010 provides very limited demographic data for urban areas (age, gender, race/origin, households, housing occupancy). The first richer demographic-economic data for the 2010 vintage urban areas became available in September 2013 from the American Community Survey (ACS) 2012 1-year estimates. These data are for urban areas with population 65,000 or more. These data enable us to, for the first time, examine Urbanized Area attributes such as employment, education, language spoken, income, housing value and costs among a wide range of other measures. Among all 2010 vintage Urbanized Areas 65,000 population or larger in 2012, the percent population 25 years and over who were college graduates ranged from 7.0% to 70.6%. Demographic-economic characteristics of urban areas are constantly changing. Use this interactive table to view, rank, compare selected characteristics of urban areas using these data. Use the APIGateway to access detailed ACS 2012 demographic-economic profiles for any selected urban area. A partial view of the Los Angeles UA DE-3 economic characteristics profile is shown below. Install the no fee CV XE tools on your PC to view extended profiles for the Los Angeles or any UA. 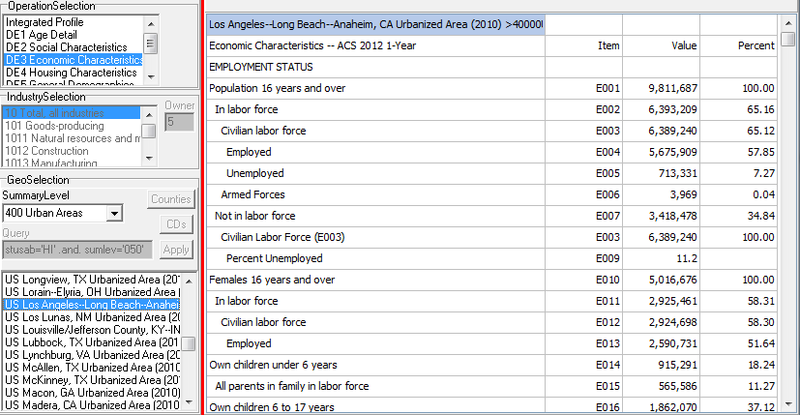 See complete Los Angeles UA DE-2 through DE-5 profiles at Los Angeles UA demographic-economic profiles. Viewing graphic with gesture/zoom enabled device suggested. The graphic presented below shows a thematic map of 2012 median household income (MHI) by 2010 Urbanized Area centered on Pennsylvania and the Northeast U.S. The legend to the left of the map shows the MHI interval color pattern. The view was developed using CV XE GIS software with items shown this interactive table integrated into the 2010 UA shapefile. Viewing graphic with gesture/zoom enabled device suggested. Hundreds or thousands of variations on pattern views such as the one shown above can be developed using the 2012 demographic-economic data in combination with the 2010 vintage UA boundary shapefile.